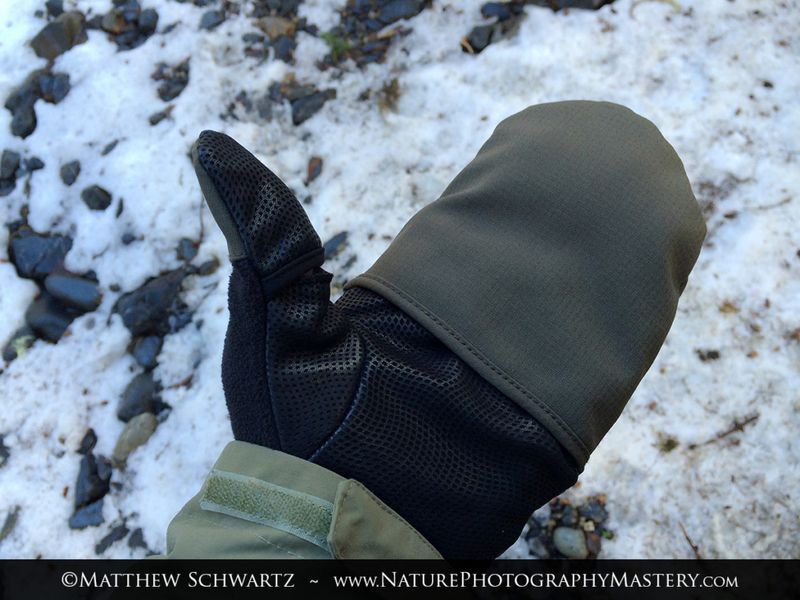 Summary: I highly recommend these excellent gloves for photography in cold environments. 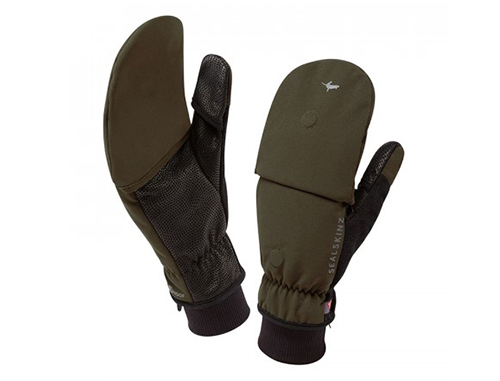 They offer the perfect balance of warmth and dexterity, and are very comfortable. When doing photography in very cold conditions, the hands and fingers can get painful, and lose sensitivity. Have your hands ever been so cold that it actually hurt to touch your camera or pick up your tripod? Have your fingers ever been so numb that you transformed into a complete klutz and you couldn’t change a memory card to save your life? If so, then you know that it makes it really difficult, if not impossible, to effectively continue doing photography. The problem gets even worse when we are staying in one place, because the lack of movement results in a drop in body temperature and blood flow, especially in the hands. Being relatively inactive is a surprisingly common thing in nature photography – imagine waiting for many hours in one spot for a wildlife subject, meticulously composing a precise macro image, or setting up for a landscape shot before sunrise. As photographers, we need to keep our hands warm, but, at the same time, we need to have manual dexterity so we can operate our equipment. After a good amount of searching for a glove which suited the needs of a photographer in cold environments, to no avail, I temporarily took a break. Several days later, I was browsing some Google images regarding a totally unrelated topic, when I happened upon a completely random photo of a very intriguing glove. After clicking through to the website page for that image, and reviewing the product’s details, I realized that I’d serendipitously stumbled upon the mythical “perfect glove” I’d been in search of for so long. That glove is the Outdoor Sports Mitten, by Sealskinz. 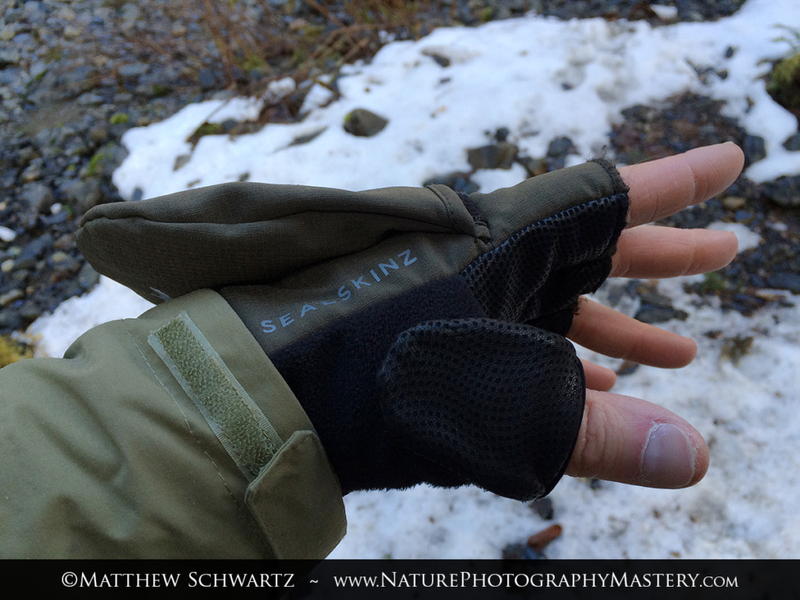 The Sealskinz Outdoor Sports Mitten is perfect for people like nature photographers, who need a very warm, waterproof glove, while also requiring excellent dexterity. 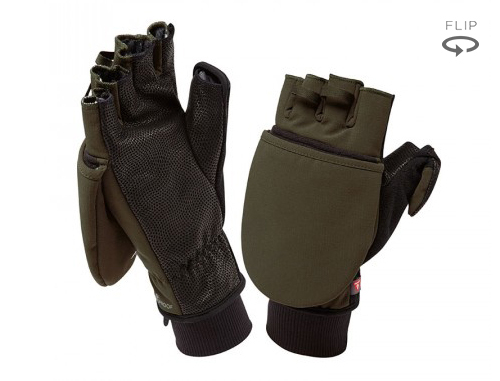 They would also be excellent for anyone else that works or plays in cold conditions, such as birdwatchers, backpackers, fishermen, and many others. Operate your camera with ease in cold temperatures, without freezing your hands off. Now you can face the bitter cold with confidence. 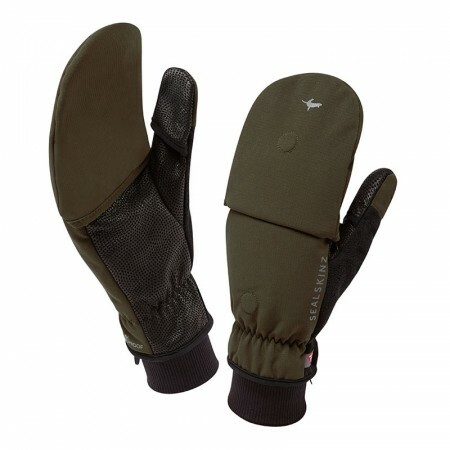 The Sealskinz Outdoor Sports Mitten offers the perfect balance of warmth and dexterity. 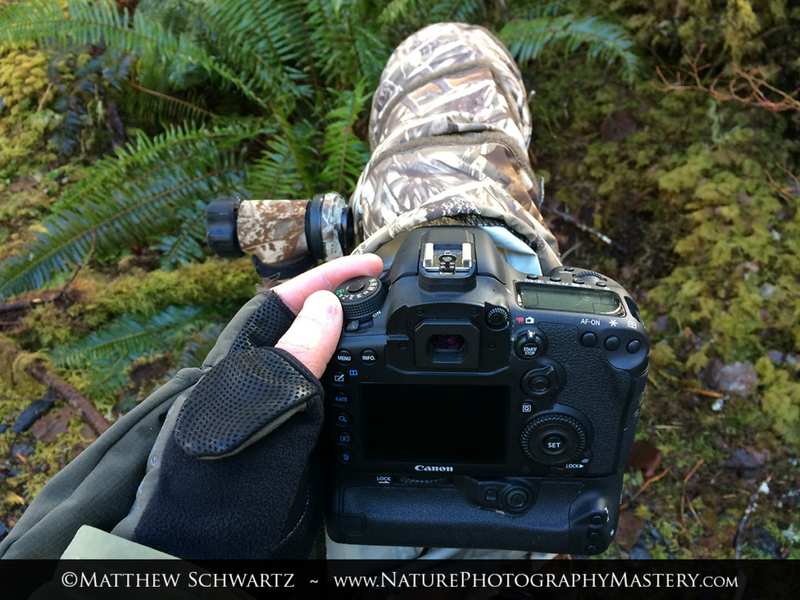 Keep your fingers covered and cozy during periods of inactivity (such as waiting for wildlife), then flip back the fingertips and mittens when it’s time to shoot photos. In the photos above, I am wearing the gloves in the warmest configuration, with the thumb tip and mitten covering my fingers. Let’s call it Toasty Mode. This was great for downtime, such as when I was waiting in a blind for my wildlife subject to show up. Since it only takes a few seconds to flip back the mitten top and thumb tip to be ready to operate the camera, I was confident that I would not miss any photos. Toasty Mode was also good while scouting, exploring, and other general activities. I was surprised at how warm these gloves were, when considering that they are not very thick or bulky. I tested them in temperatures around, and below freezing (32 degrees Fahrenheit, and below), and they kept me comfortable. Sealskinz uses what they call a “Thermal Rating / Climate Guide” to specify the warmth level of their gloves. These Outdoor Sports Mittens, on a scale of 1-5, are rated at a 4 (Heavy-duty protection for cold climates). I can’t speak to their performance in ultra-cold situations, such as in single-digit or negative temperatures, but I’m assuming at that point you’d want to get a glove rated at 5. The entire inside of the gloves, including the mitten, is lined with a very soft, thin, fleece material (see video). As you might expect, Toasty Mode was not effective for tasks which required secure grip, or sensitivity. Although the mitten top is flexible, and you can bend your fingers to wrap around things (such when picking up a backpack), the palm side is not grippy, and it’s difficult to really feel what you’re doing. All of this is fine, because the entire point of this configuration is to keep your fingers warm, not to do precise activities. In the photos above, I am wearing the glove in the most dexterous configuration, with the thumb tip and mitten flipped back, and held in place by the embedded magnets. We’ll call this Convertible Mode. The gloves were comfortable and flexible, and I was pleasantly surprised with how well I could move my fingers, and complete various tasks. The palm material is soft, and has some sort of textured coating on it that seems to increase grip, which is useful when carrying a tripod and similar things. In between shooting photos and other activities, if I needed to warm up my fingertips a little bit, I could flip the mitten tops over for a few minutes. Later in the day, I put a hand warmer in each mitten top just to see how it would feel…it was fantastic. The amount of thought that Sealskinz put into these gloves is apparent, and it shows up in some nice little details that make my life easier. The stretchy wrist cuff on the glove fits close to the skin, and extends nicely up the forearm, so it easily tucks inside a jacket sleeve. In other gloves with a bulkier, wider, shorter cuff, it can be difficult to get it to stay inside your jacket sleeve, thereby leaving a gap for cold air and water to sneak in. As you can see by the photos above, I was able to easily and precisely operate my camera when the gloves were in Convertible mode. The materials used in these gloves are stretchy, which I found made them very comfortable, well fitting, and maintained my ability to operate in an unrestricted manner. 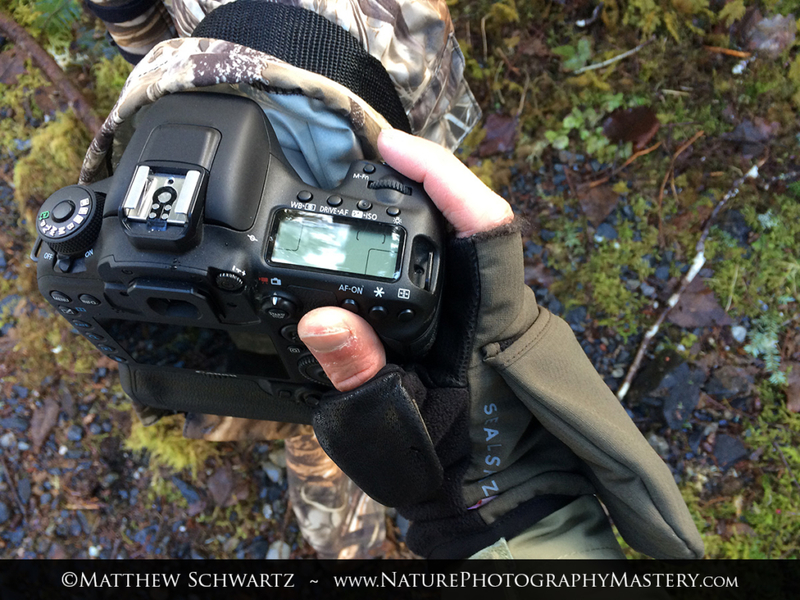 I would go so far as to say that, at times, I forgot I was wearing gloves – especially when I was actively photographing wildlife. The flipped back mitten and thumb tip were relatively unobtrusive most of the time, and I didn’t feel like they ever got in the way of what I was doing. One slight negative was that the thumb tip didn’t always stay fastened back to the magnet. When I was relatively inactive, such as when just operating the camera buttons, the thumb tip stayed put, but when I was physically moving around a lot, setting up equipment, and so forth, it seemed to pop off. This was just a minor annoyance, and did not interfere with my ability to complete any tasks. One other problem I experienced was that the thread stitching around the cuffs of the fingers would snag on Velcro. I experienced this issue while working with two pieces of gear: 1. The Kwik Camo blind, which has velcro along the front which wraps around the lens hood, and, 2. My Outdoor Research gaiters, which have a Velcro closure along the front. This was one of the very few negatives I found with these gloves, and something I can live with – I’ll just remove the gloves briefly when I need to work with velcro. In this video, I show the magnetic fasteners. This video shows the fleece which lines the inside of the glove. 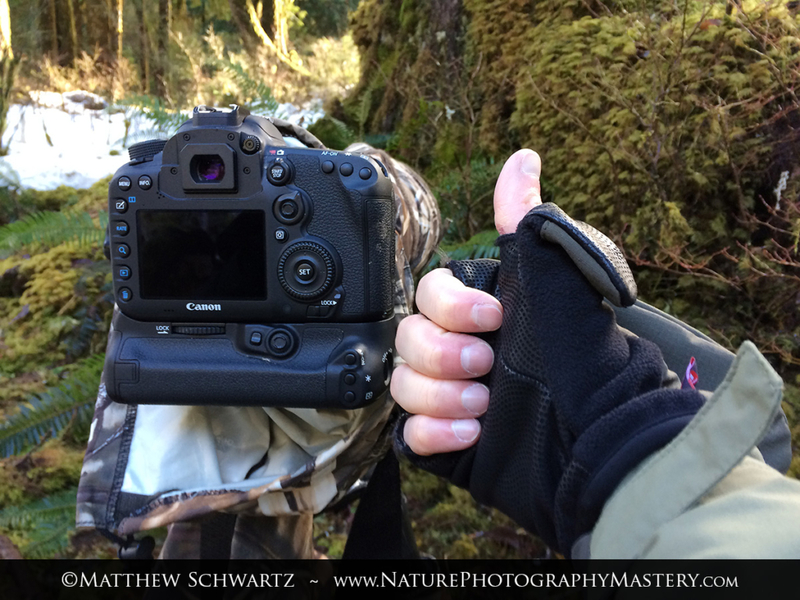 The materials and construction of Sealskinz Outdoor Sports Mittens protect your hands from chilling wind and wet conditions, so you can keep shooting while other photographers pack up and head home. NOTE: These gloves are not intended to be used in water. Although the gloves are marketed as being “waterproof,” water may enter inside the glove if it gets beneath the mitten top or thumb slot. For that reason, I’d advise against using them in heavy rain, or if you need to pick up very wet objects. 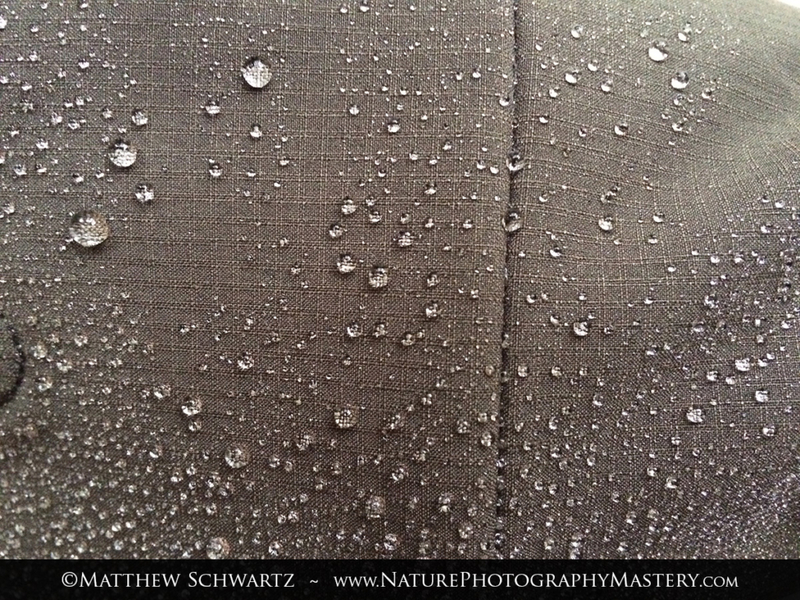 In this video, I give an impressive demonstration of the water repellency of the gloves. As noted above, the gaps where the thumb tip and mitten top hinge over are definite entry points for water. In fact, when creating this video, I tilted my hand down too much while pouring the water, and some of it splashed into the mitten top. But, for our purposes in this review, the goal is not to find gloves which can be used in water. 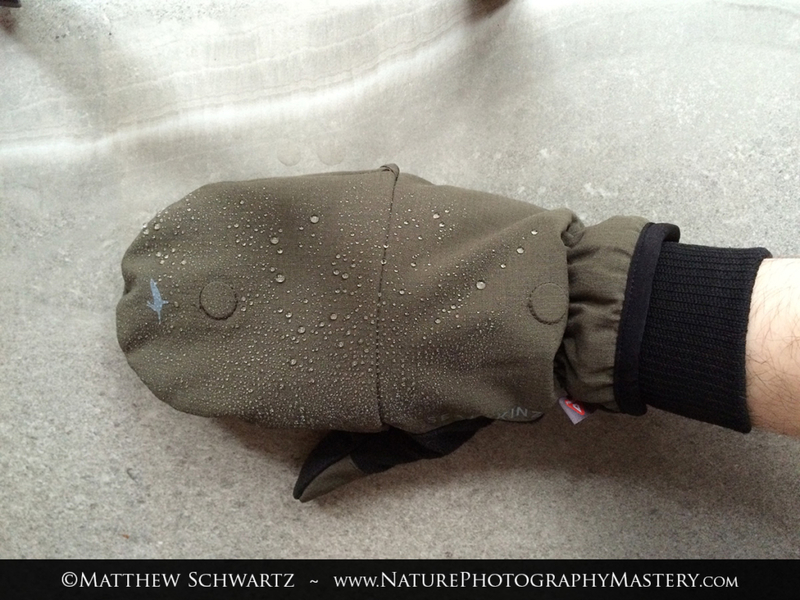 Instead we just want warm, water repellent gloves, which are useful for nature photography in rain, snow, or damp locations. These photos show beads of water on the glove surface, again demonstrating how effective they are at keeping your hands dry and comfortable. Although the video and photos in this review only exhibit the water repellent outer material and coatings, there is a truly waterproof membrane beneath the surface. Surprisingly, the gloves are quite breathable, due to the microporous technology which is used in the membrane. When removing the gloves, make sure to tug on both pull loops equally, to minimize the stress on the loop stitching. When the tips of the gloves are just beyond your fingertips, grip all four finger cuffs, and pull the rest of the way off. By pulling on a larger portion of the glove tips at this point, instead of just the pull loops, you avoid putting undue stress on the pull loop stitching, especially as the glove’s narrow wrist area passes over the widest part of your hand. By following these tips, the pull loops should remain in service for a long time. For serious warmth, put hand warmers in the mitten tops (see recommended accessories section). Always follow all hand warmer instructions and warnings to avoid personal injury or property damage. If possible, avoid touching the exposed finger cuffs to Velcro or similar materials, which can snag and damage the stitching. (See full review commentary for more information). If your safety in a particular situation depends on your dexterity or ability to feel with your fingers (for example, climbing up and down a ladder), fold back the mitten and thumb tip temporarily until you have safely completed the activity. With that information in mind, if cleaning is necessary, I would suggest gently wiping away dirty spots with a clean, wet cloth. After each use, I’d recommend drying the inside of the gloves (as I would any clothing, footwear, and wearable accessory). You need to dry out the sweat and the humidity from the environment, to avoid odors and bacteria. You should not expose the gloves to excessive heat, such as a machine dryer, radiator, or fireplace. 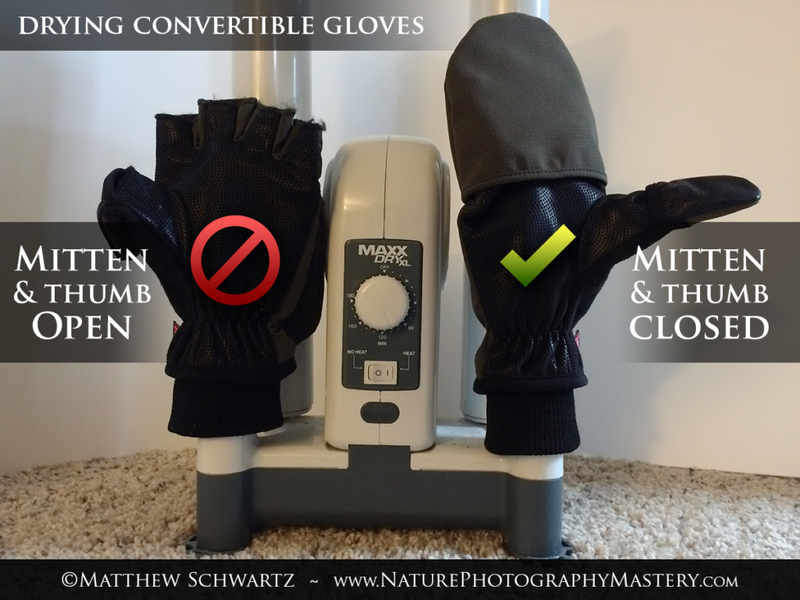 A very low temperature glove dryer should be fine – I highly recommend the MaxxDry XL Boot and Glove dryer (see recommended accessories section). When drying the mittens on a glove dryer, put the thumb tip and mitten top in the active position (not folded back) so the air can flow into them and carry the moisture out. Great for drying gloves, hats, socks, footwear, and even tall rubber boots; it can hold up to four items at one time. You can purchase extensions which allow you to fit chest waders on the unit. The dryer has two settings: No Heat, and Heat. A timer knob can be set for any amount of time, up to three hours. I always set it for three hours, to ensure maximum drying, and sometimes I do a second round of drying (usually needed if I get a bit of water inside my waders). TIP: If possible, remove footwear insoles before drying. These are disposable, air-activated warmers. They stay warm for a good 8 hours or more. The packaging states that they warm up in 15 to 30 minutes, but I’ve found that they take at least one to one and a half hours to really heat up; I’d suggest activating them on the way to your location. Good for fitting in pockets and gloves, but be careful not to burn yourself. Avoid storing them too close to sensitive gear like camera equipment. 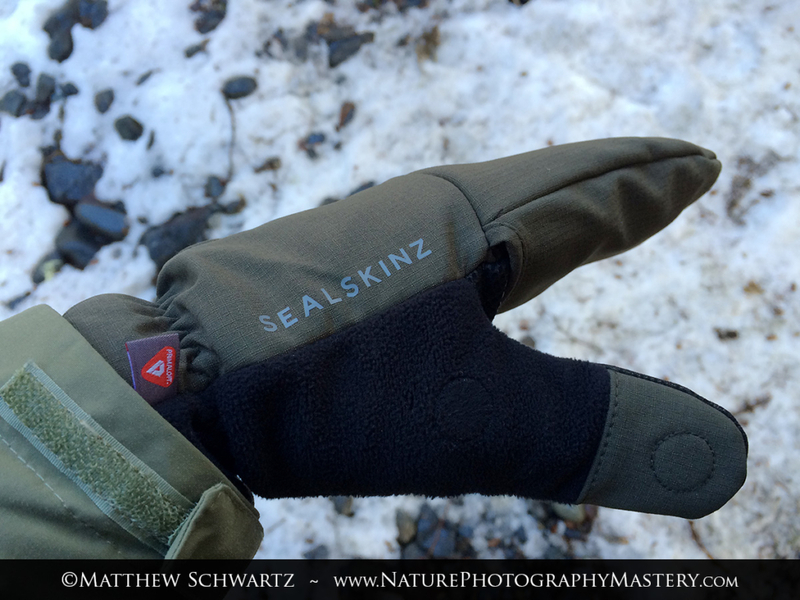 I highly recommend the Sealskinz Outdoor Sports Mitten for photographers working in cold environments. They offer the perfect balance of warmth and dexterity, allowing you to convert them from a cozy mitten, to a fingerless glove, within a matter of seconds. The excellent design, quality construction, and perfect materials make them extremely comfortable and easy to work with. There were a few minor things that I didn’t like, such as the thumb being a tad long, the thumb tips not always staying put on the magnet, and the finger cuff stitching catching on velcro equipment, but these negatives are far outweighed by all of the positive things about the gloves. 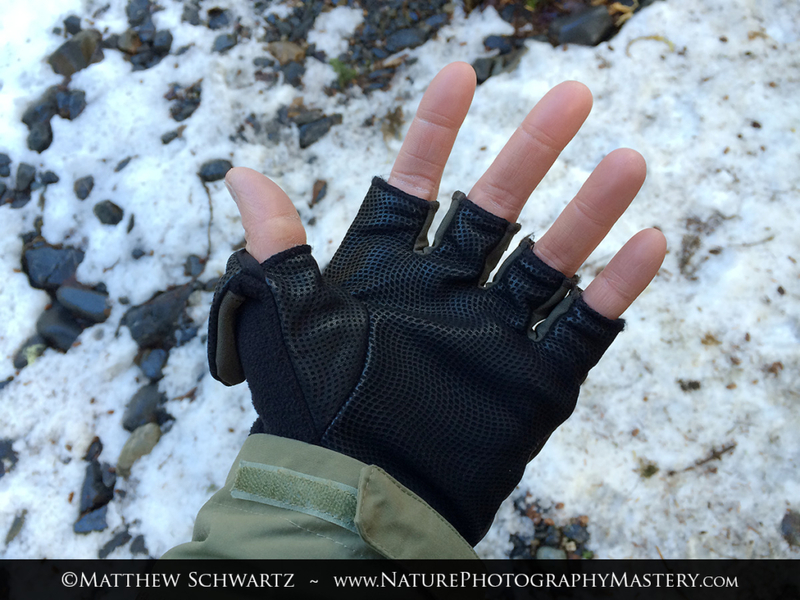 If you’re in the market for an excellent pair of cold-weather gloves for photography, or might need a pair at some point, I recommend you pick up a pair of Sealskinz Outdoor Sports Mittens. Get more photography tips, insights, and mindset secrets!